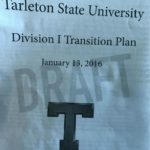 A copy of the Jan. 13, 2016 Division I Transition Plan – stamped “DRAFT” and which has not been publicly released – was given to Texan News by a person who asked not to be identified. According to the Transition Plan, reclassifying to Division I will “require an additional investment in intercollegiate athletics, primarily in student athlete scholarships.” As outlined in the Transition Plan, Division I Athletics spending without external revenue will increase from $7.4 million in 2017-2018 to $10.6 million in 2022-2023. Similarly, Tarleton’s budget will increase from $174 million in 2017-2018 to $202 million in 2022-2023. The draft was given to Texan News by someone who wished to remain anonymous. Photo by Arynn Tomson. Although there is some speculation that Division I is only awarded by the size of the school, this is not the case, says Michael Landis, an assistant professor of history and a member of the faculty senate at Tarleton. Landis says he also taught at a Division I university. “I spent one year as a visiting assistant professor of history at Sacred Hearts University, a small catholic school in Connecticut. It was smaller than Tarleton, but being Division I isn’t about the size of the school; it’s about the types of facilities you have. It’s about the number and amount of scholarships you have for your athletes and there are a couple of other components as well,” Landis said. The report shows that the budget for scholarships for men’s sports will increase from $1.6 million in 2017-2018 to $3.4 million in 2022-2023. The budget for scholarships for women’s sports will increase as well from $1.2 million in 2017-2018 to $2.3 million in 2022-2023. 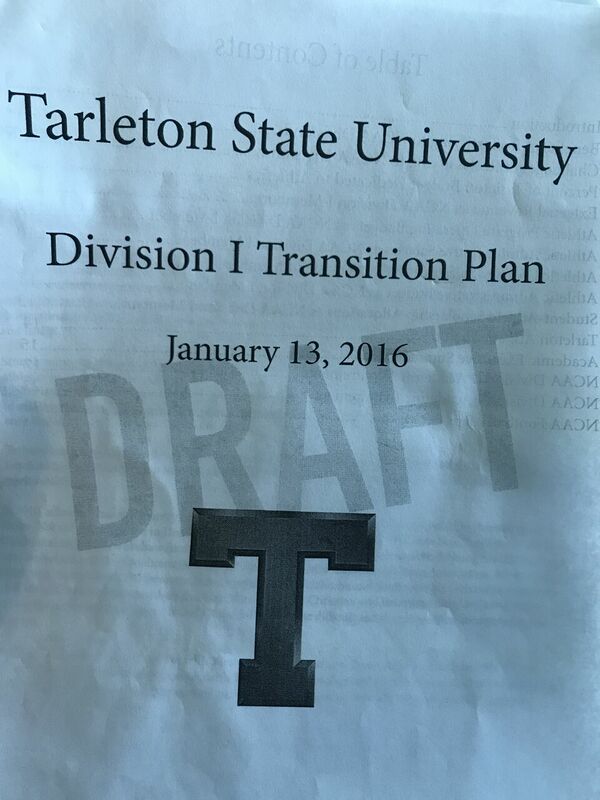 Tarleton State University has been looking to reclassify to Division I since 2003. In order to reclassify to Division I, Tarleton has to be invited to a conference. However, Reisman says Tarleton has not yet been invited to a conference.